Well-designed strategic IT plans provide a solid foundation for streamlining enterprise-wide processes, enhancing services offerings, and supporting effective decision-making. Organizational improvements are achieved by assessing the IT infrastructure, renovating business processes, upgrading technologies, updating job responsibilities, training, and changing the rewards system. Many recognize the value of a strategic IT plan; however, the process can be daunting. The good news is that these plans do not need to be complex to be effective. In its simplest form, strategic IT plans explain the business rationale for technology, how and why technology is used, as well as define a process for future planning. Sciens focuses on simplifying business operations and IT management by identifying the needed services and the value to your customers, and outlining each step for improvement. Field-proven, scalable and clearly structured recommendations help align operations with the needs of the business. Keeping the plan straightforward makes it easier for stakeholders to understand and support. Every stage in our planning process is designed to engage all levels of the organization and develop consensus around the strategic direction. Our goal is to enable more efficient collaborative planning and coordination of initiatives, resources, and investments to meet business objectives and mitigate risk. A formalized cross-departmental process is better for assessing proposed technology projects as they relate to the overall organization, and setting the direction and prioritize initiatives for IT. Sciens works directly with clients to navigate the potentially sensitive process of establishing a Governance Committee comprised of managers from different departments. We can help select appropriate committee members, and reinforce the charter of the team to avoid potential communication pitfalls. Sciens offers a fresh perspective reviewing overall organizational processes and how they relate to each other instead of focusing on a single function. The greatest productivity gains are achieved when departments collaborate to eliminate redundancies for performance improvements. Monitoring an organization’s performance never ends. Establishing relevant metrics enables ongoing measurement and continual performance improvements. Every stage in our planning process is designed to engage all levels of the organization and develop consensus around the strategic direction. Our goal is to enable more efficient collaborative planning and coordination of initiatives, resources, and investments to meet business objectives. This cooperative effort enables better risk assessment to avoid potential negative outcomes. A large part of any technology investment is creating a strong business case for the upgrade by communicating the value and benefits of the system. Sciens assists clients with translating technology-speak into business performance gains and a positive return on investment (ROI) that all stakeholders can understand and support. By defining the selection criteria and comprehensive specifications for the Request for Proposal (RFP), management is better equipped to assess prospective vendors and make technology investment decisions. A well-documented and systematic process simplifies responses to vendor inquiries. A procurement strategy defines the scope of the project, potential risks, scope of services, and evaluation measurements. Sciens provides a vendor evaluation matrix based on vendor responses. Responsive and agile project management, and disciplined vendor oversight ensure the quality and integrity of the vendor deliverables meet client needs within acceptable timeframes and budgets. Once established, efforts should be made to continually optimize and fine-tune these processes. Many times, individual departments lack an understanding of the technology and the priorities of other departments. IT may lack a full appreciation of the business impact. The key to good IT management is instituting a formal cross-departmental governance process to assess all proposed technology projects as they relate to the overall organization. Sciens works directly with clients to navigate the potentially sensitive process of establishing a Governance Committee comprised of managers from inward and outward facing departments. Members of the committee define the role of the IT department and set priorities with a broader, integrated perspective. With this layer of guidance and oversight, IT’s role is not to set IT priorities, but instead focus on executing the priorities selected by the Governance Committee. Instituting Governance control prevents the IT department from becoming overwhelmed by conflicting requests. When IT priorities are set by managers using most of the IT resources, they will understand the challenges facing IT and become its greatest advocates. Planning extends beyond scoping the project, selecting the vendors, and implementing the change. An often-underestimated step in strategy development is communicating the strategy. After taking the time to analyze and create a comprehensive plan, make sure it is easily understood by the entire organization. By taking the final step of thoroughly communicating the plan to the entire organization, the staff will understand the objectives clearly and will be better equipped to support the new plan. For true transformation, information management should be emphasized more than just information technology. The priority should be on accessing the information needed to make important decisions in a timely manner, not just on capturing and storing data. Sciens focuses on the organization, as well as control of the structure, processing, and delivery of information – not just the software and hardware of information systems. Sciens specializes in analyzing the value of complex technologies and management tools – such as cloud platforms, data management, device management, network coverage, and security and application development – to create a comprehensive IT strategy. We work with enterprises to architect organizations, processes, and capabilities for scalability and performance. Your operation is only as efficient as its processes, and as effective as the organization implementing them. All operations are built on processes that help complete projects and fulfill customer needs. Improvements in service quality and staff efficiency can be achieved by updating existing processes, and applying the proper mix of technologies. 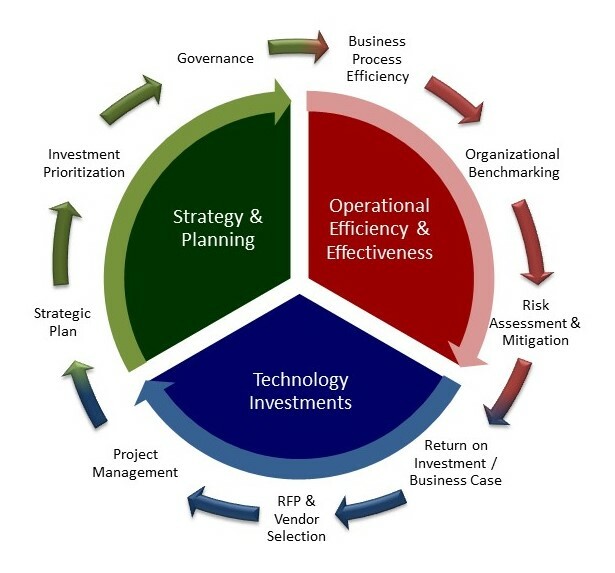 Sciens aligns the business strategy with processes and technologies to simplify and enhance operations.